Chef Alex Padilla of The Original Ninfa's On Navigation's hoists his trophy after winning the Best Chef On The Block competition on ABC's "The Chew." Photo courtesy of ABC/Lorenzo Bevilaqua. Updated, 2/22/2018, 3:34 p.m.: Padilla won the final round of the competition with a ribeye bruschetta on butter-fried toast topped with fennel and asparagus salad and a citrus dijon vinaigrette. He beat out a cod dish made by fellow finalist Jonathan Dearden of Radiator in Washington D.C. According to a press release, Padilla plans to donate the $1,000 cash prize to a charity that fights cancer in children. The bragging rights, though, as well as a trophy are his to keep for a lifetime. After winning the regional “Best Chef On The Block” competition sponsored by the ABC talk show “The Chew,” executive chef Alex Padilla of The Original Ninfa’s On Navigation advanced to the national finals in New York. The final round is being televised on Thursday, February 22 at noon Central Time. 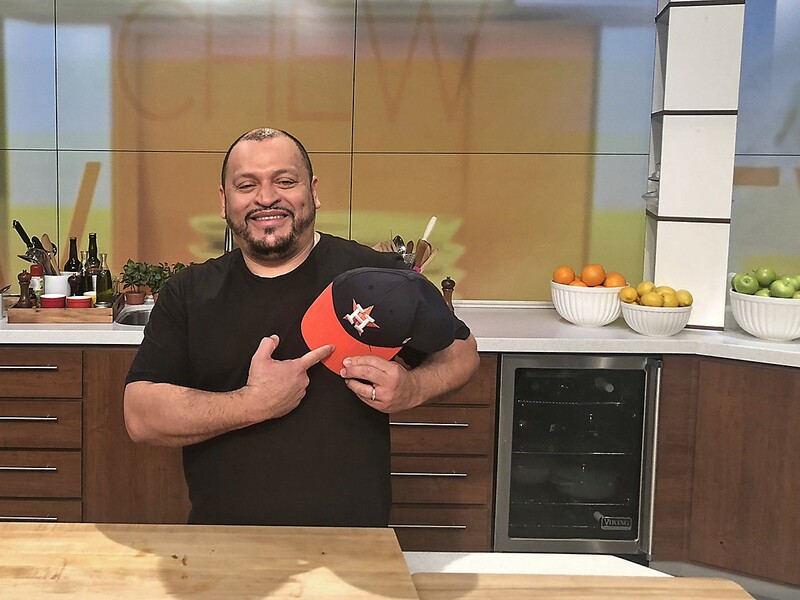 Executive chef of The Original Ninfa’s On Navigation and Antone’s Original Po’ Boys shows off his Astros baseball hat on the set of ABC’s “The Chew.” Photo courtesy of The Original Ninfa’s On Navigation. For today’s semifinals, chefs were divided into “West Coast” and “East Coast.” Padilla was categorized as a West Coast chef. Celebrity judges Gail Simmons of “Top Chef” and Food & Wine, and Buddy Valastro of “Cake Boss” and Carlo’s Bakery judged one dish from each chef. Scoring was based on taste, execution and originality. Padilla beat chefs from Seattle, Los Angeles, Chicago and Atlanta with his Fajita Burger made with outside skirt steak, grilled onions, poblano peppers, avocado, chipotle mayo and Oaxaca cheese. 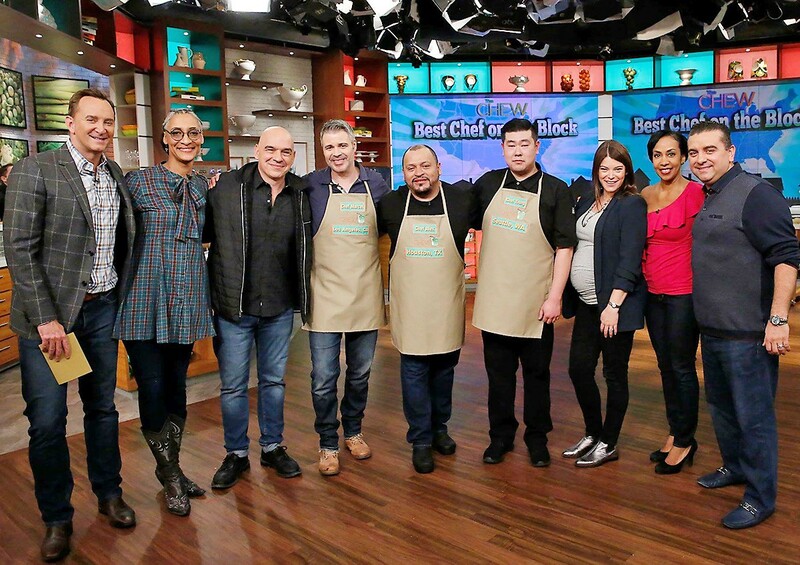 Executive chef Alex Padilla (center) with co-hosts of “The Chew” and his fellow competitors. Photo courtesy of The Original Ninfa’s On Navigation. To win the final round, he will have to make a more impressive “on the fly” dish than Washington D.C. chef Jonathan Dearden of Radiator. Padilla and Dearden will only have 20 minutes to do all the preparation and cooking needed for a finished dish. The judges for the final round are Laila Ali (boxer, cook and daughter of Mohammad Ali) and chef Michael Lomonaco of PorterHouse New York. 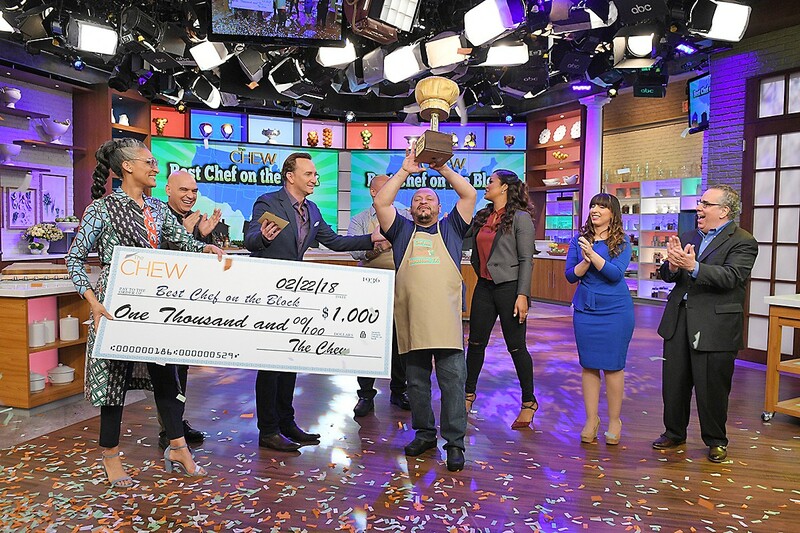 The winning chef receives a trophy, $1,000 and the chance to demonstrate a favorite recipe on “The Chew” on Friday, Feb. 23. The competition is a rare slice of national attention for Padilla, a chef who has long been a steward of one of Houston’s most iconic restaurants. We’ll update this story tomorrow with the competition results. I was so proud to see Chef Padilla bring home this trophy for Texans! Rooted him on all week. WAy to represent, Chef! Just saw this on the chew today!! Way to represent Houston Alex!